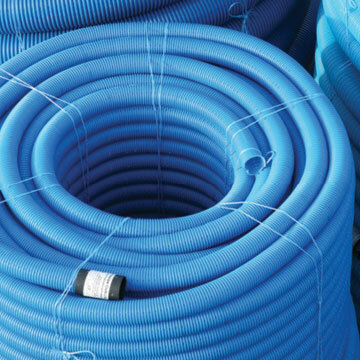 Land and surface water drainage pipes come in either flexible singlewall coils or more robust twinwall pipes. These underground pipes are perforated to allow surface water to penetrate then transporting it to a soakaway. Singlewall pipe provides quick and easy installation and is supplied in various lengths. Manufactured in HDPE, Twinwall Drain has a smooth internal bore with a corrugated external wall, providing outstanding resistance from impact giving robust strength and durability. 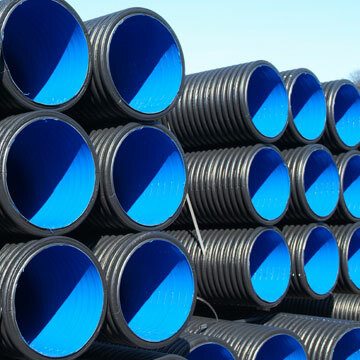 Civils and Lintels work with Polypipe to supply market-leading land and surface water drainage products suitable for civil engineering & agricultural uses. Key Polypipe ranges include the flexible Landcoil and twin-wall Ridgidrain products. Ridgidrain – The very first twinwall surface drainage system in the UK with Highways Authority Product Approval Scheme (HAPAS) status, Ridgidrain has a high strength to weight ratio and flexibility to resist high traffic loads. It has a low friction inner wall for improved hydraulics and comes in 6m lengths to significantly reduce the number of joints and risk of leakage. Made from 100% recycled, high strength HDPE using a structured wall design to produce a robust, yet flexible pipe, Ridgidrain has a high resistance to the most common chemicals. It offers excellent performance, meaning you get all the benefits of sustainability, strength and lower weight without compromising on long term effectiveness. Stocked in 100mm, 150mm, 225mm, 300mm, 375mm, 450mm & 600mm sizes, all are BBA Certified. Ridgidrain is available in 750mm and 900mm diameters and 3m lengths as part of the Ridgistorm XL range, see our Stormwater Management section. Landcoil – This range is designed to aid the successful management of land water and is manufactured from PVCu in a range of diameters and coil lengths. It offers significant improvements in areas where poor drainage negatively affects ground quality; from agricultural applications requiring enhanced soil conservation or crop production capabilities, to sports and leisure projects struggling with waterlogged sections of pitch or turf. This cost-effective system offers perforated and unperforated options and a full range of pipes and fittings in sizes from 60-200mm, each coil is supplied with 1 coupler. Landcoil is flexible, durable and easy to install with blue systems Kitemarked to BS 4962. 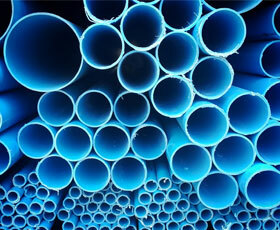 To order pipe for your land or surface water drainage project, contact your local branch.